Margaret Dyer has carved out a unique career as one of the US’s finest chamber musicians. This season’s highlights have included appearances with the Daedalus Quartet, the Amphion Quartet, and at Vienna’s Musikverein with A Far Cry, Boston’s acclaimed self-conducted orchestra of which she was a founding member. She has been a guest artist with other chamber groups such as ECCO, the Knights, Moscow Chamber Orchestra, and St. Paul Chamber Orchestra. 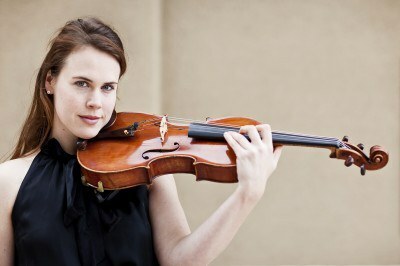 Ms. Dyer was a fellow in Carnegie Hall's Academy Program and she has taught viola and chamber music in Mexico, Peru, Abu Dhabi, and around the United States. Although her training was entirely classically-based, Margaret enjoys collaborating with artists of all styles. Some of these more household names include John Legend, Michelle Williams, Rufus Wainright, David Sylvian, Grizzly Bear, Owen Pallett, and David Saw. She recently performed on the soundtrack for the acclaimed film, Orchestra of Exiles, and she was a member of 2013 Radio City Christmas Spectacular orchestra. Margaret holds degrees from the San Francisco Conservatory of Music and the New England Conservatory. She can be heard on recordings by NEOS Label, Iris Records, and Fortune Records.